This is one of the easiest recipes in the world. Forgot to thaw the chicken? No problem. Have some random tidbits of lettuce or beans in your fridge you need to use up? Perfect. Planning to be out of the house all afternoon and need something ready to eat when you get home…but you only have five minutes before you need to rush out the door, you forgot to make a dinner plan, your daughter can’t find her left shoe, the delivery man knocks on the door, and your toddler is running toward the toilet with your cell phone? Chicken Tacos to the rescue. This idea came from my friend Emily. She’s an awesome mom of two little ones. I admire how she is always working to put healthy meals on the table, while trying to save time in the process. Hmmm, kind of sounds like the majority of us, huh? We need easy, fast, tasty…and we want it to nourish our families too. That’s why I thought you’d like hearing this recipe idea. My family loves these because they can build their tacos however they like. I love this recipe because it’s adaptable based on what I have in my fridge and pantry. If I don’t have whole wheat tortillas made, but I do have some organic corn chips on hand? That’s how we eat it. 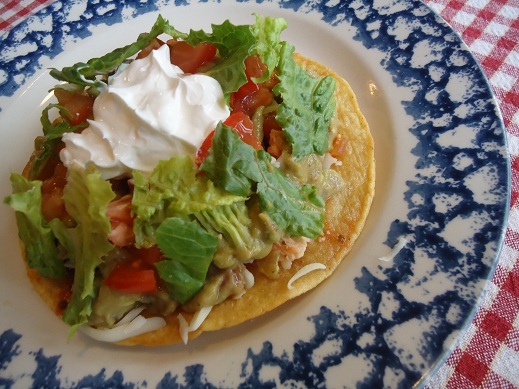 And last week, I decided to fry some corn tortillas in palm shortening and have Chicken Tostadas with this recipe instead. Incredibly delicious. Place chicken (frozen, thawed, upside down, whatever) into your slow cooker. Serve with any of your favorite taco fixin's. What is your favorite way to top a taco? Last week when we had these, I asked Asa (our oldest) to make his famous Spicy Avocado Dip. It was so good with this chicken! I literally giggled when I read that first paragraph. Haha. Chicken tacos is one of my family’s favorite recipes! We actually sprinkle the chicken with a bit of chili powder and lime juice. After a few hours, I’ll shred the chicken and add some salsa and frozen corn – then it’s ready to go after another hour. Easy-peasy and delicious! We make this also, but if I have time, I will add some of your homemade taco seasoning, lime juice and fresh cilantro. Cook the same amount of time, you won’t regret it! Laura, where do you like to purchase your b/s chicken breasts from? My family loves this quick, easy and super tasty dinner! I usually sprinkle with chicken w/taco seasoning and throw in a can of corn and can of black beans (drained and rinsed) before the whole jar of salsa. Besides being easy, this makes enough to feed an army so I usually share 1/2 with a friend. They’re always happy to get the call that this meal is on our menu for the week! :) Thanks, Laura! Hi Crystal…I’d say it makes enough to feed 8-10 adults easily! Our family of 4 (2adults, 2 young kids) usually share half with another family of 4 and I *still* have leftovers for a few days. I use around 2 lbs of chicken breasts. Going out to get some chicken from the freezer right now! This sounds so handy to have around and good! I think I’d like it on organic nacho chips with some cheese. Yummy! I make chicken taco meat with the equal of a packet of homemade taco seasoning for every pound of chicken. Tacos,enchiladas, nachos etc. Yummy. Also use homemade ranch on it sometimes. Make chicken roll ups with that also. Your crockpot refried beans is one of my favorites. Thanks. What are the crockpot refried beans? What’s the recipe on that? I couldn’t find it here. I made this last night and split it up for us and a family with a cute newly adopted baby. My husband tasted it and asked if it was gumbo. Whatever works to get him feed. Just wanna say YOU ROCK! I am glad I stumbled upon your site… your recipes are soo MOMMY friendly! Being a single mom with two awesome two leggeds and four FOUR leggeds gets a bit chaotic!!! At any rate, I totally dig these recipes, fun, funky, and full of flava!! not to mention wholesome! Gracias! Laura, do you make your own salsa? If so, do you have a recipe? So I did this a couple of years ago. I really wanted chicken tacos for dinner! However, mine turned out so soupy that we ended up having chicken tortilla soup. I just shredded the chicken, added in some beans and frozen corn and we had yummy chicken tortilla soup! 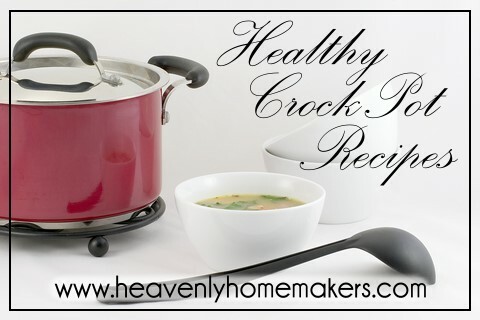 This is one of my go to meals in the crock pot. So… I came to comment that I made this in my new Instant Pot today! ???? only to see that Melissa told us that would work way back in 2013!!! Why did it take FOUR YEARS for me to hear about Instant Pots? This is literally changing my world. Thanks, Laura, for pushing me to get one on Prime Day – I’m not looking back! For anyone else who’s new to the IP, this is what I did: frozen chicken thighs (6-7, about 3lb), 1 tsp salt, 1-2 c salsa. Manual, high pressure, 20 minutes. Took right at 45 minutes to come up to pressure and cook. Delicious!!! Add homemade taco seasoning. You’ll love this recipe twice as much. Seriously.